I arrived at Four Seasons at 29th December 2011 for my 24 hour session. It was bitterly cold and the wind was a cold one and it was battering into the peg 4/5/3 area. I decided to drop into peg 4 as there is a lot of water in front of it. After having a chat with the bailiff, he told me that Lodge Lake hadn't produced a fish for 4-5 weeks. Lodge being the hard lake as it is, this didn't surprise me. I somehow managed to throw the bivvy up. Bit of a struggle as I had big winds driving into my face. I noticed that the waves in the edge were corroding the bank making the water in the edge rather coloured. My plan of action was to fish around 3-4 rod lengths and go incredibly light on the bait, scattered only a few boilies over each of my rods. Fishing for a bite at a time like I usually do on Lodge, with the lake being such a small stock, and the carp seeing kilos and kilos of bait every week. I flicked two rods close in and slackened them right of, by the point the wind had picked right up. 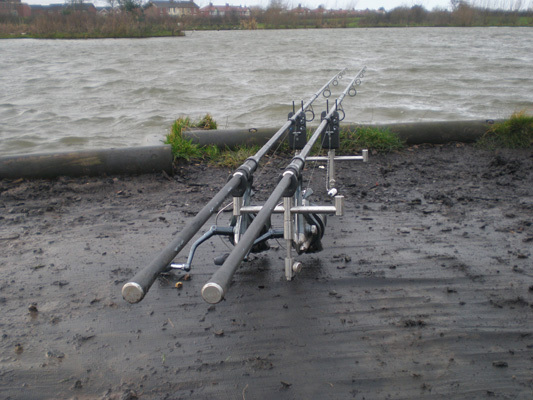 Evening came and I wound the rods in, put fresh rigs and bait on each rod. I wrapped paste round one of my hookbaits, then dipped the paste in salt. Meaning the hookbait would be leaking attraction. Both rods went out absolutely perfect. I settled down for the night and had a bit of a social with my mate Sam, and a few other visits of people. 5:00 am the next morning I was woke up to a series of around 5 bleeps. Then another short burst of bleeps. I scrambled and the bivvy and noticed the left had rod which was positioned around 4 rod lengths out had tightened right up, I lifted into the fish and it was gradually kiting right, I had a bit of a struggled feeling contact with the fish because the wind was so bad, after a few other short bursts of life, the fish popped its head up and my mate Sam finch slipped the net under it. I peered down into the net to see a box like big common, we got it out the water, and seen a little bait hanging out the bottom lip. The paste bait had done the business. We slipped the fish into the net and pegged it down and waited for it to get light. I was only then that I appreciated the sheer beauty of the fish, a dark mahogany coloured common was looking back at me. I snapped the net and rolled it down, I lifted the net out of the water and the scraper 20 we originally thought was totally forgotten about. 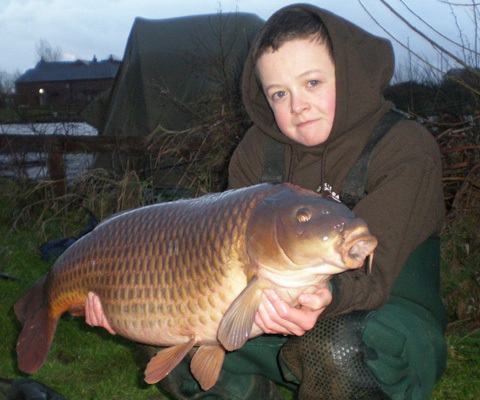 We slipped it into the trakker weigh sling and lifted it up onto the scales, 25lb 5oz. 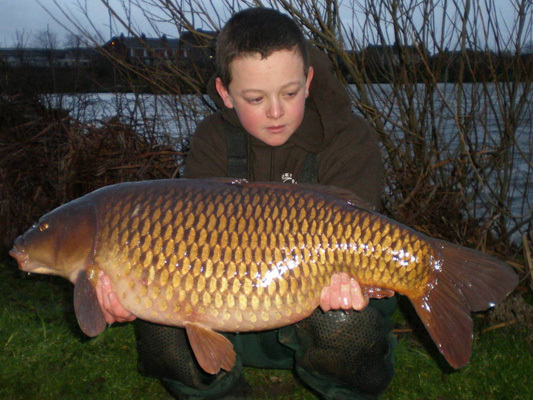 New Pb common, in the depths of winter, when the lake hadn't produced a fish for 4 or 5 weeks. I guess when your names on a fish it really is! 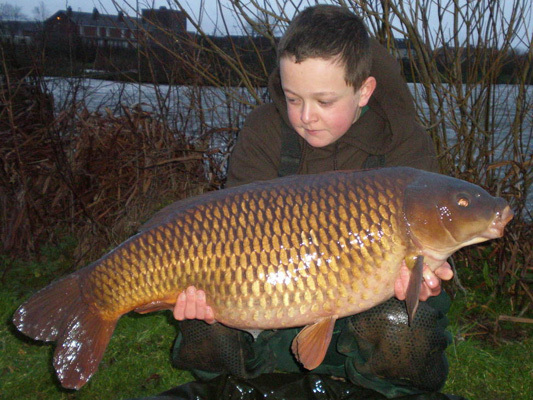 The fish was taken on a Redeye Baits Tuna & Robin Red 15mm boilies. With around 20 baits scattered over two rod. Couple with 8 inch blowback rigs with size 8 wide gape little shrink tube kickers and 2oz leads on leadclips. Over the moon wasn't the word! !